Car design is alchemy. It is a cauldron into which a master sorcerer puts a pinch of this, and a spoon of that. Mix the right ingredients, and you get an explosion. 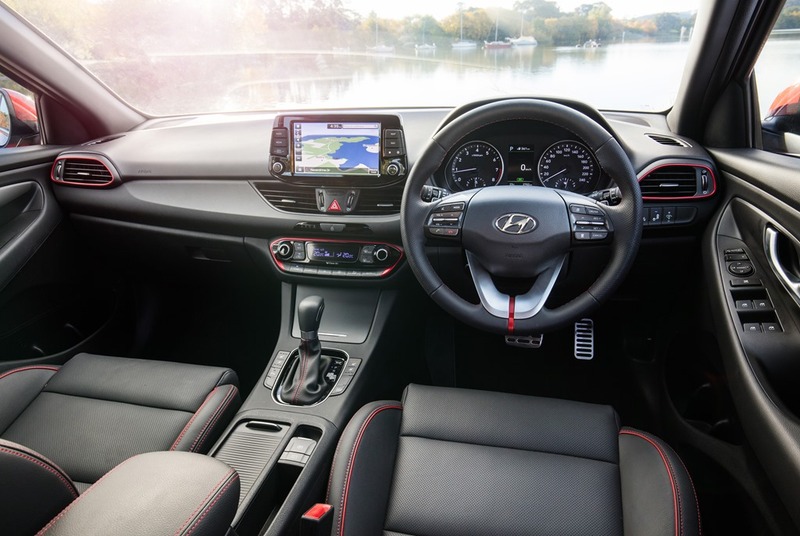 The Hyundai i30’s cauldron has brand new ingredients cleverly blended with a touch of old. They’ve even tweaked the recipe racing-style, and called it “N”, as if it sits a few seats down from “Q” at the “00” lunch table. Hyundai is so confident their alchemist has the right formula, they threw vast resources at it, and the result, in a word, is, “remarkable”. “N” won’t be with us for a while, but if you watch the up-coming video carefully, its ghost may appear disguised as a caped crone cowering in the background. If you think I am done with visual imagery, you’re wrong, such was I moved. The sorcerer’s name is Beurkle, Thomas Beurkle (pronounced Berk-La). He spoke lovingly of each and every line, bump, handle, and mirror. Before I get on to the meat and potatoes, I want to share a pearl of wisdom collected while having a casual chat with Thomas, after a slap-up lunch on a farm. Its bucolic charm oozed from every leaf. He said he made the rear hatch handle wider. He wanted people to be able to open the door comfortably, even if the space at the shops was tight and you had to stand to the side to reach over to open it. That kind of attention to detail extends to every part you can see, touch, and feel. The rest you can’t benefit from unless you press the starter button. The sorcerer brought his clay model from Germany. Imagine a 100kg excess weight bill being sent to the first-class lounge, and you’ll appreciate the trouble he went to, to show it to us. The new grille is Thomas’ way of integrating the Korean’s range, and giving an instantly identifiable face onto which he can graft whatever kind of vehicle he likes. We’ve seen this in other German cars before haven’t we? Thomas joined BMW in 2000 and was responsible for the 3 and 6 series. In 2005, he Joined Hyundai. Since then, Hyundai has been shameless in its pursuit of the European look. Most buyers equate German cars with quality and longevity. How many of the Germans have warranties as long as the Koreans? But, I’m still off-piste to let me lasso myself back to the point which is, i30 is fabulous, inside and out. There is the pov model, Active, which is anything but pov. There are a further 4 models, diesel Elite and Premium, and petrol SR and SR premium. The latter 2 have a sporty bent lavished with lashings of luxury, yes, luxury. The SR has big 18” wheels with meaty 225 tyres. Inside, there is leather (“appointments”, so some of the leather is simulated), and an interior which seems unbelievable for the price. Red highlights surround the vents and radio, and the seats have red piping and stitching. There is even a red anodized highlight on the steering wheel reminiscent of rally cars. I’ll come back to the motorsport angle later. The interior designer, Tayo Osobu, once worked for Bugatti, and she brings a classy feel to the cabin. 150kw, once hot hatch territory, is now warmish at best. The N range will cater for boy-racing enthusiasts. The SR Premium gets a Multi-Link suspension upgrade from the torsion beam in the rest of the i30s. There is a veritable slew of tech inclusions to keep millennials beaming with self-absorbed satisfaction. Apple CarPlay/Android Auto/DAB sits in a system displayed on an 8” tablet floating above the centre of the dashboard where once there was only fresh air. It looks like a docked gaming system, and is even easier to user than a phone. If you have an Iphone, you can use Siri for voice commands. If you don’t fancy pressing a button, you can simply say “Hey Siri, call home”, and it will. Hyundai was so pleased with themselves, they used the inbuilt Satnav (with 10 year free updates) to direct journalists in and around the Murray River town of Albury. The android-based system has a good quality screen and the CPU has a smooth flowing motion, easily beating the jerky, freeze prone Germans at their own game. Apart from being more rigid than before, the body is 28kg lighter thanks to extensive use of high-strength steel. The chassis tuning is done by a white-coated team headed by ex-Brit consultant, David Potter. They’ve given the ride near-magic-carpet feel, and the handling incredibly sporty, even on the entry level Active. David’s touring and rally achievements gave solid wins to Subaru, VW, BMW, Ford, Honda, Nissan and Peugeot to name but a few. So not only is the designer a one man Who’s Who of the pen and paper set (yes, he told me her prefers the old pen and paper era), but the chassis tuner wins rallies and touring car championships. Keep in mind, the N versions are coming soon. The mind boggles. Some brands have a bias to handling, or ride, but rarely both. Although the turbo petrol SR has sporty aspirations, it is every bit as comfortable as the diesel “comfort models” thanks to the upgraded multi-link suspension. The tradeoff is a space saver spare tyre instead of the full-size spare in the rest of the range. The engine/transmission options include: 2 petrol and a diesel, coupled to a 6 speed manual, 6 speed auto or a 7 speed DCT. I could explain that DCT means Dual Clutch Transmission, and how it works, but you’d lose the will to live by the time I was finished. The petrol turbo direct injection in the SR/SR Premium is my favourite combo with the 7sp DCT. It revs freely with no vibration and the DCT is incredibly smooth. The SR Premium has paddles for manual shifts, but we didn’t get a chance to sample a manual transmission. The drive sorts the men from the boys, and the i30 felt composed, even during this driver’s nether-clenching errors of judgement. When pushed hard, the SR Premium had plenty in reserve. The sports mode DCT kicked down in almost psychic anticipation of corners, but changed up to be as economical as possible. Having said that, when you’re really having fun, economy is the last thing on your mind. You can really throw the i30 around, and it has to be said, it is every bit as good as the competition. It is a much better drive than Corolla. The blind spot monitor flashes as a an object gets where the car thinks you can’t see it, and beeps and flashes furiously if you then indicate to change lanes. The Lane Keep Assist has 3 modes, and beeps if you stray across a line. There is also an active mode. It steers you into the lane by applying torque to the steering wheel, but I didn’t find this particularly effective. The icon on the dash board is green when the system is active, and white in stand by. It spent most of the time in stand by. There is Rear Cross Traffic Alert on the reversing camera to stop you from banging in to tradies at Bunnings as you reverse out. I’ll be leaving that one switched off. Emergency Autonomous Braking operates at above 10kph, up to 60kph for pedestrians, and a slightly insane 180kph for moving traffic. Clearly, we won’t be needing that top speed on the cattle tracks Australia calls highways. They say that below 60, it will bring you to a complete stop. Above that, it will mitigate impact though I’m not sure how much mitigation will occur at 180. Should you throw out the anchors, the brake and hazard lights flash to warn traffic around you. Annoyingly, a monitor will pester you to take a break if it thinks you’re getting tired. Smart Cruise Control will keep pace with slowing traffic, and has a queue-assist function. It takes you to 0kph, and after 3 seconds you need to hit the Resume button on the steering wheel, or blip the accelerator to start up again. This is so you don’t mow down pedestrians about to cross the zebra. Of course, you’ll need to brake yourself it the light changes and there is no one in front of you. i30 is handsome and nimble. It is fun to drive and very, very comfortable. It smoothed out even the most appalling dirt roads, and has an impressive suite of active and passive safety accoutrements, especially for cars costing under 35 grand. Ranging between $20,950, and $33,950, there are enough options to suit many, many, pockets. Although Hyundai says most sales will be the base model, the best value is the range topping SR Premium. I liked the engine/trans combo, and the cabin was beautiful. It also has all the bells and whistles I’ve come to think I can’t do without. Blind spot, and active cruise are so handy but the lane keeping is annoying unless you’re weary on a long trip. You can pay $2,000 for a sunroof, and $295 for a beige interior, but if you don’t fancy shelling out extra shekels, i30 is perfectly fine just as it is. AEB is not yet available on the base model, but around $1,800 should buy it when it comes as an option. Hyundai continues to grow, but it is the “value for money” moniker that is its raison d’etre. Although I’m slightly disappointed that the electric steering is column mounted instead of rack mounted, you simply can’t have everything. Importantly, with Hyundai iCare you get: a 10 year Sat Nav Update Plan for i30 customers.